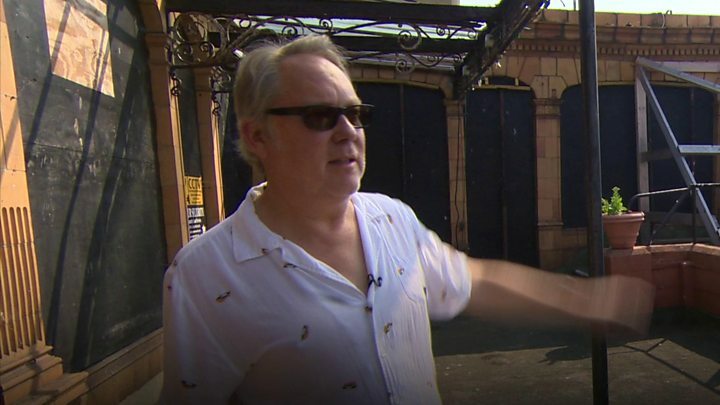 Comedian Vic Reeves is backing calls to save a Grade II-listed building after revealing it was the place his grandfather had a final cup of tea before heading off to war. The Leas Pavilion in Folkestone opened in 1902 as a tearoom. Over the years it was used as a theatre and entertainment venue until its closure in 2007. Between 1914 and 1918 it was where many British soldiers had their send-off. The Edwardian building is now owned by developers with plans for flats. Reeves - real name Jim Moir - said his grandfather also Jim Moir, then aged 16, was among those to have a last cup of tea at the pavilion before making the walk down the Hill of Remembrance and boarding a ship to France to fight in World War One. The comic, who lives nearby, close to Ashford, said the building was not only a "beautiful bit of terracotta Art Nouveau architecture" but also a "really important part of our history". It is also said to be haunted by the friendly ghost of a former caretaker. The Friends of the Leas Pavilion group (FOLP) has been campaigning for it to be saved, and Reeves said he would like to see the building returned to public use. "Places like this really need saving, because they're of an era, and they just aren't built like this anymore. "This has always been a place for people, and it should be a place for people again... It's great to go and see a play or band or tea dance or whatever in a really beautiful place." Developer Churchgate bought the pavilion a decade ago and had until April this year to start work on approved plans for 68 high rise flats. It did not meet that deadline and would need to re-submit a proposal to Folkestone and Hythe District Council (FHDC) for planning permission. Liz Mulqueen, chairman of FOLP, said: "The building continues to deteriorate, although FHDC are in the throes of compiling a list of repairs for a repairs notice - which is the first step towards compulsory purchase. "We continue to put pressure on the council as we have always done, and will do in the future, so that the iconic building is not allowed to crumble." Churchgate said £200,000 had been spent on urgent structural repairs since 2016.